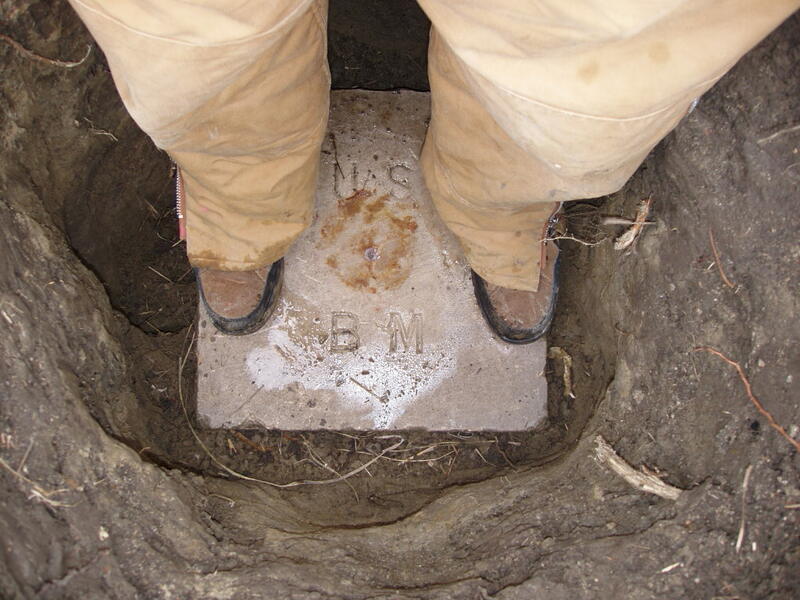 The Missouri River Commission (MORC) was established in the 1880's to survey and map the Missouri River. During the early phases of this process they established permanent monuments for both horizontal and vertical control. These monuments were well ahead of their time consisting of a two-piece mark with both an upper and lower point. 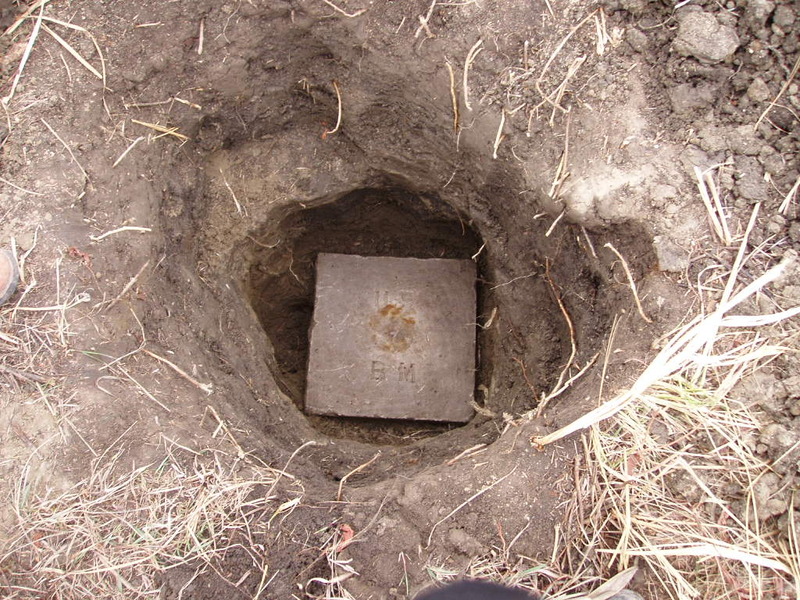 The lower monuments were square stones with a copper bolt leaded into a drill hole in the center. 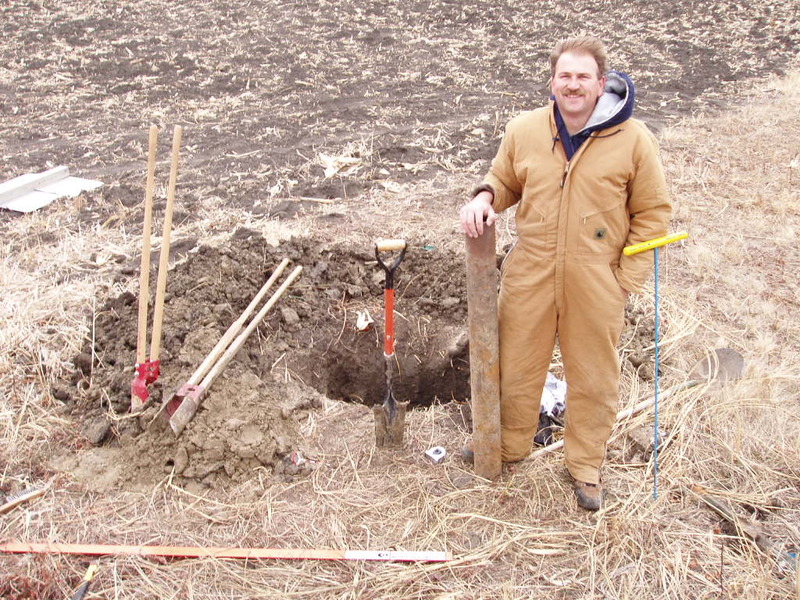 These stones were buried approximately 3.5' below the surface. 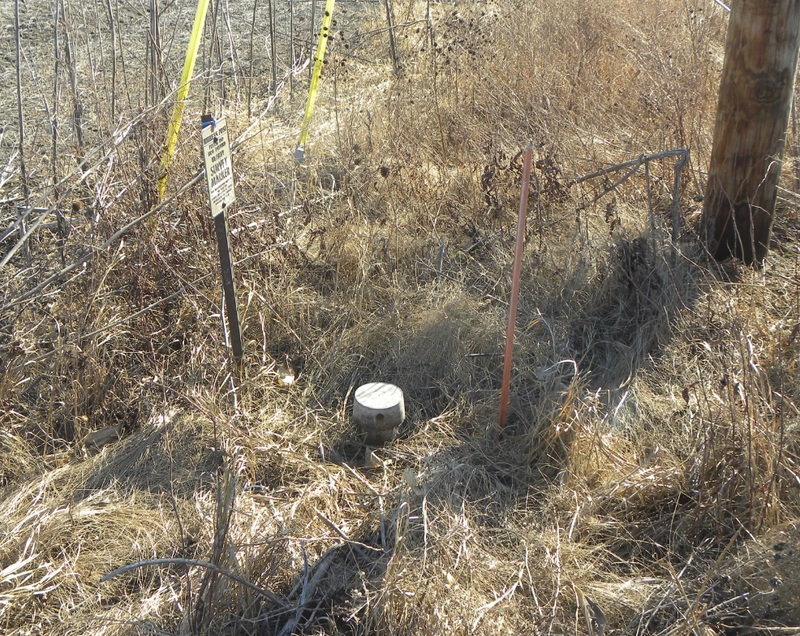 The upper monument was a 6" diameter cast iron cap over a 5" diameter steel pipe being 4' long and placed directly over the copper bolt in the stone. 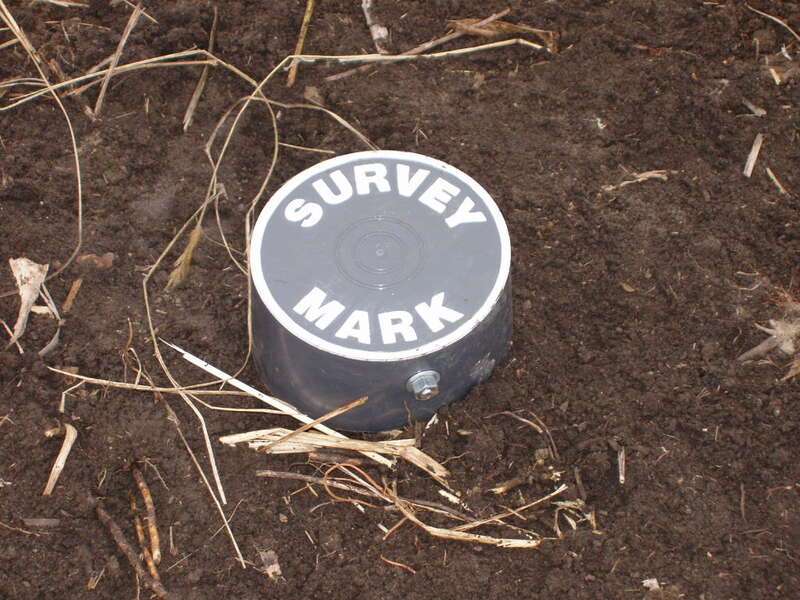 This was a very early use of iron for survey monuments since most were stones. Elevations were established and published for both the lower copper bolt as well as the top of the cap. The lower point would serve as the precise point. Access to the lower monument would be made by removing the bolted cap and lowering the level rod down into the hole to the copper bolt. These monuments along Nebraska, Iowa, and Missouri were placed around 1889 or 1890. 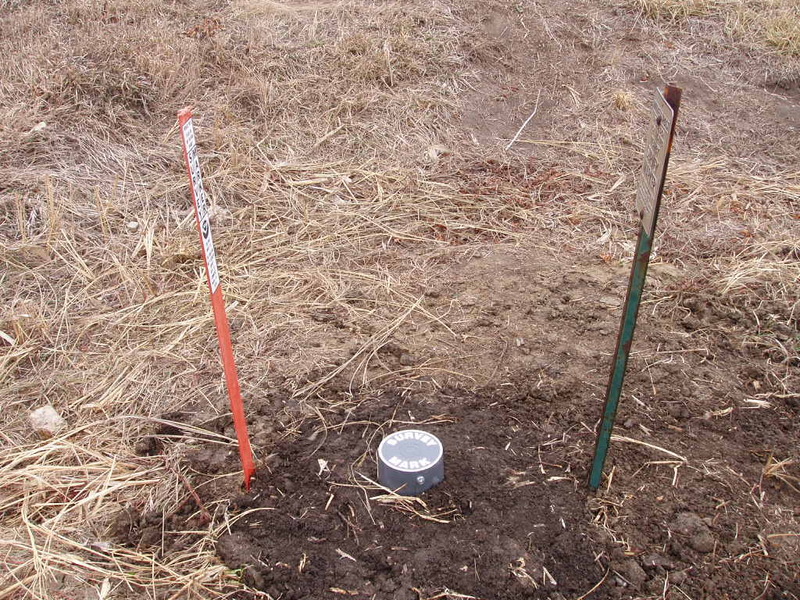 They preceded any permanent control points established by both the USGS and the USC&GS. 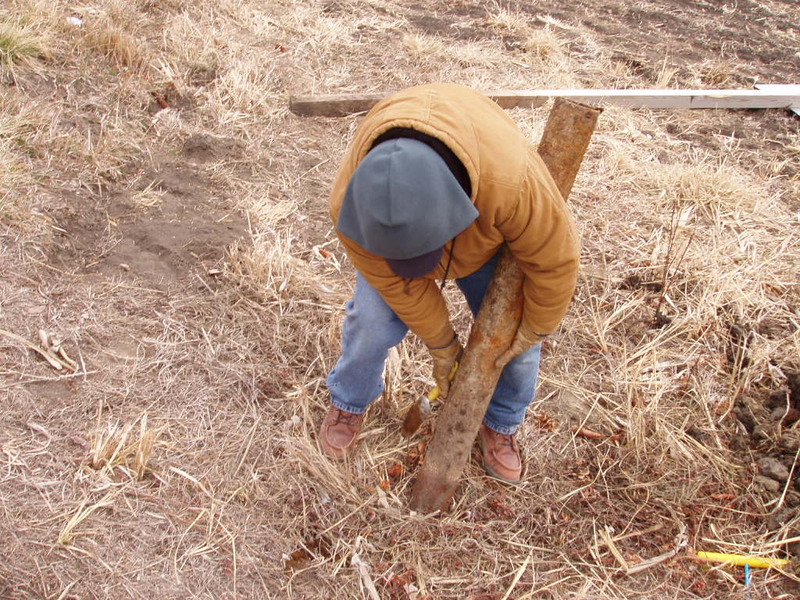 The work done by the MORC was extremely accurate and entailed practices to a degree that are as precise and often better than much of the surveying being done today. 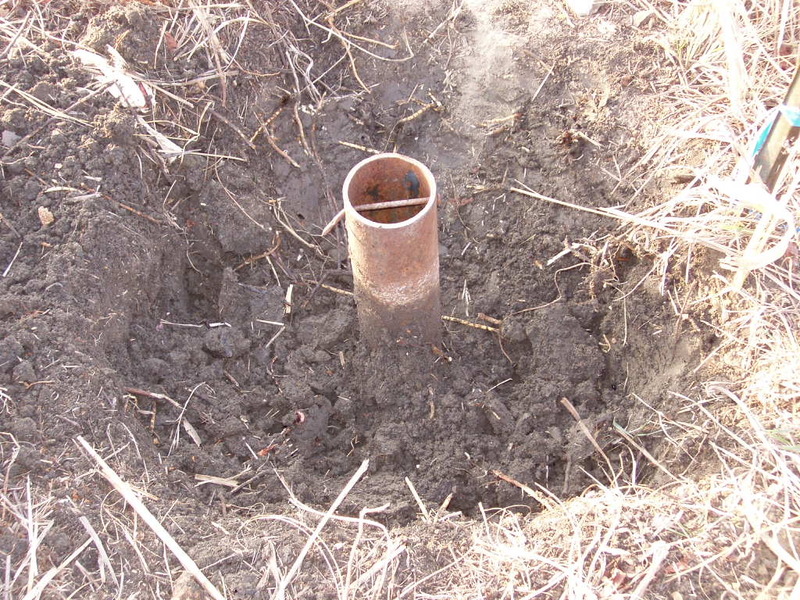 Due to the destructive and procuring tendencies of man, a large amount of the cast iron caps have been removed from the top of the pipes. 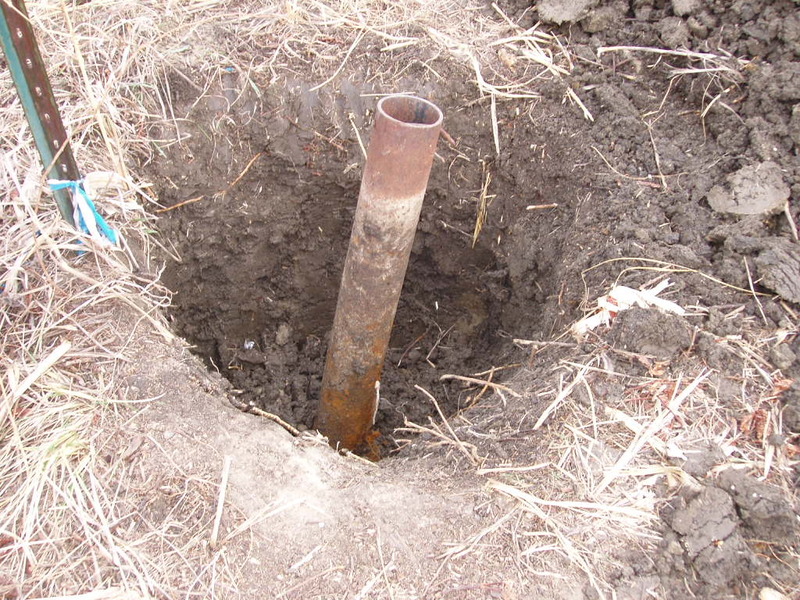 In some cases the entire pipe with cap have been taken leaving the buried stones very difficult to find. 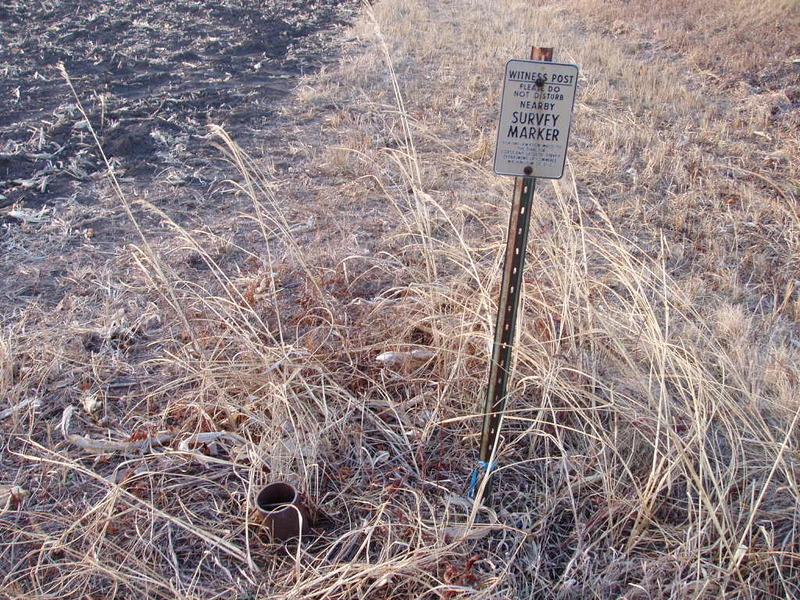 During three separate searches that were specifically planned to find these early markers, I have only personally found two bench marks where the cast caps were still on the pipes. 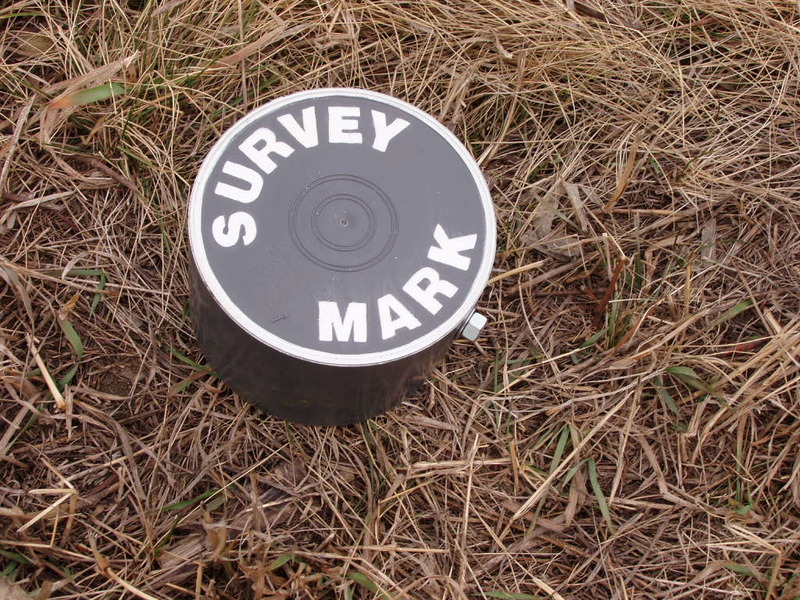 On May 20, 2005, fellow Nebraska surveyor Gene Thomsen and I searched along the Missouri River in the Nebraska, Iowa, and Missouri areas for the 1890 MORC marks. 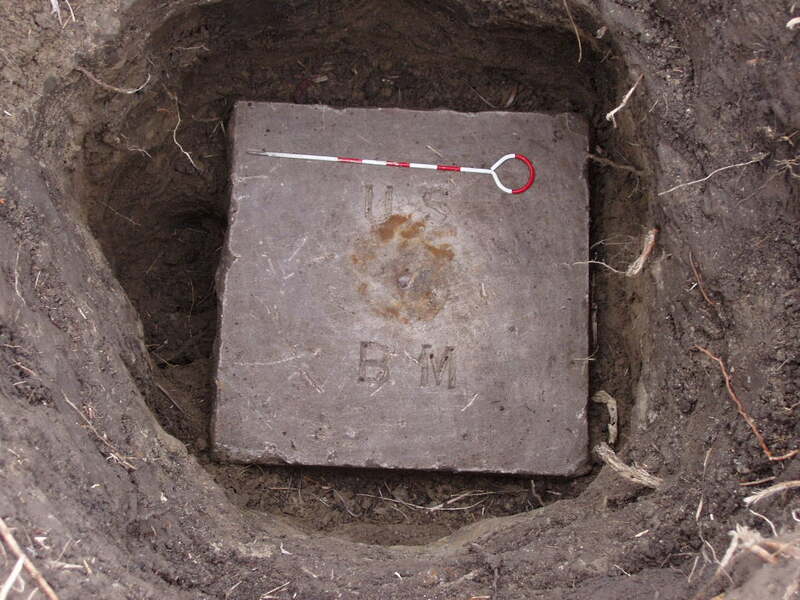 Among those we found that day was bench mark 109/3 which is located on the Iowa / Missouri state line about a mile east of the present Missouri River channel. We found the iron pipe leaning and without the cap. Due to time restraints that day we decided to return another day to dig down to the lower stone. To our knowledge there was no accurate description or photograph available that detailed what a MORC stone with copper bolt actually looked like. 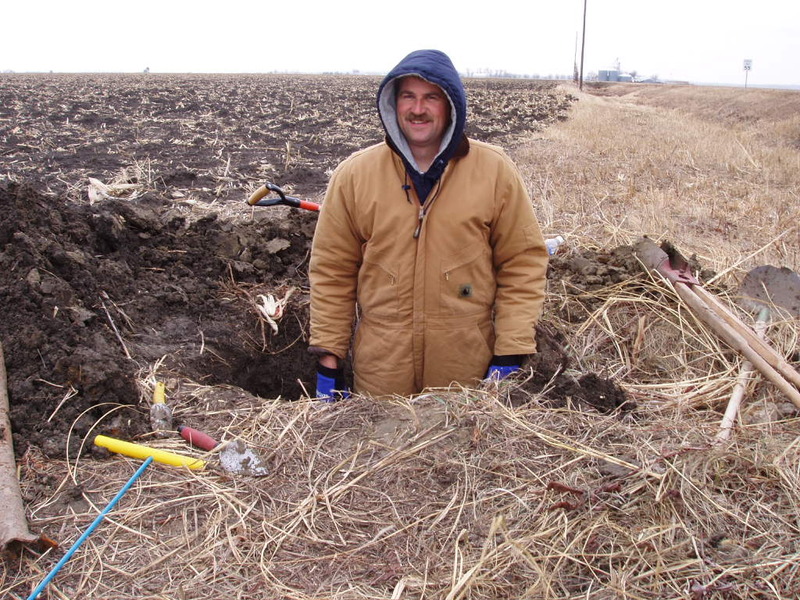 We returned to the site on January 16, 2006, and found the pipe as we had previously discovered eight months earlier. Knowing we would need a cap to cover the pipe, I made a plastic cap that could be bolted to the iron pipe to keep dirt out of the pipe. The following photos show the result of our work to remonument this historic 116-year-old bench mark. 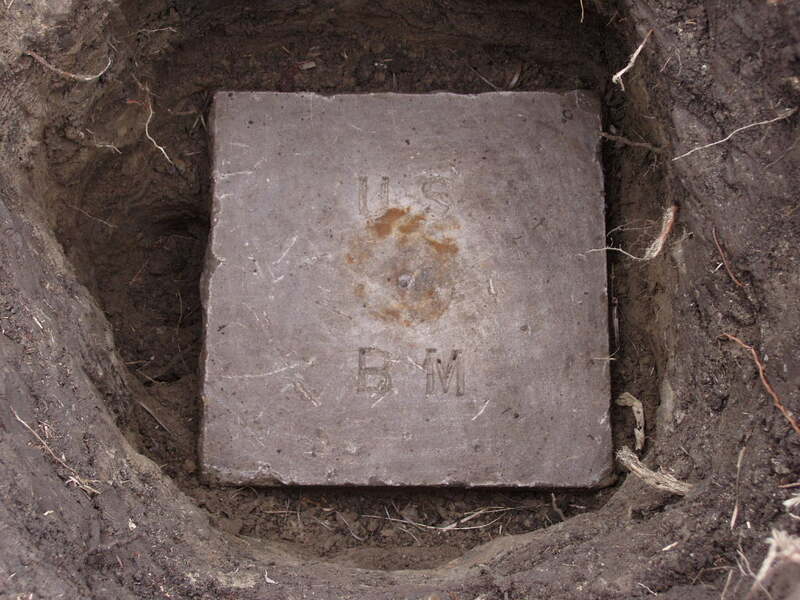 The bench mark as it appeared upon discovery. 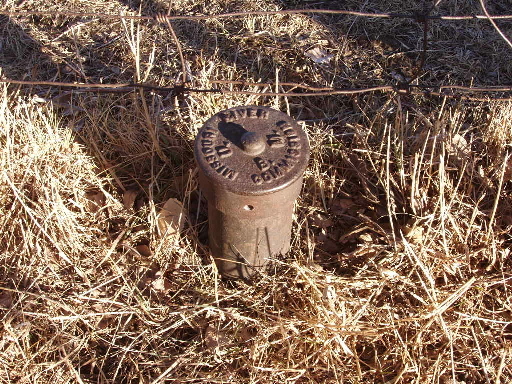 The iron pipe should have had a 6" diameter cast cap which was stolen sometime after 1961, which is the date last recovered by the C&GS. 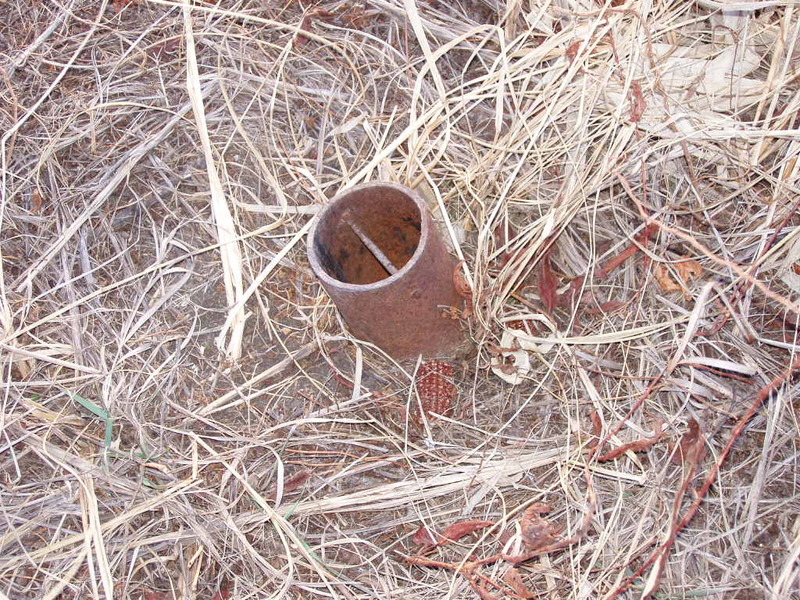 Close-up view of the top of the pipe. 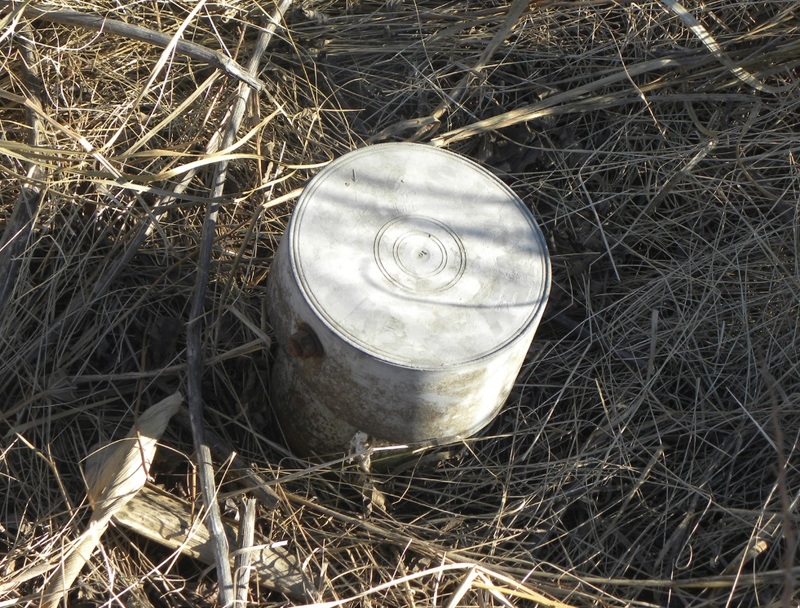 A 60d spike had been placed through the bolt holes that once secured the cap to the pipe. The digging begins to remove and relevel the pipe. This photo gives a better idea just how much the pipe was leaning from vertical. An unexpected guest was discovered about 2' below the surface. Jerry in the hole which is almost complete down to the stone. 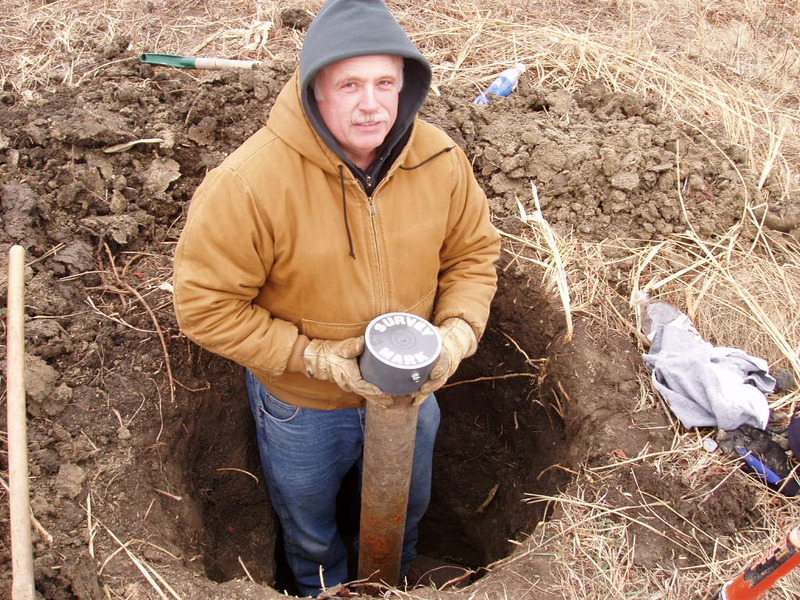 Gene with the 5" diameter pipe. 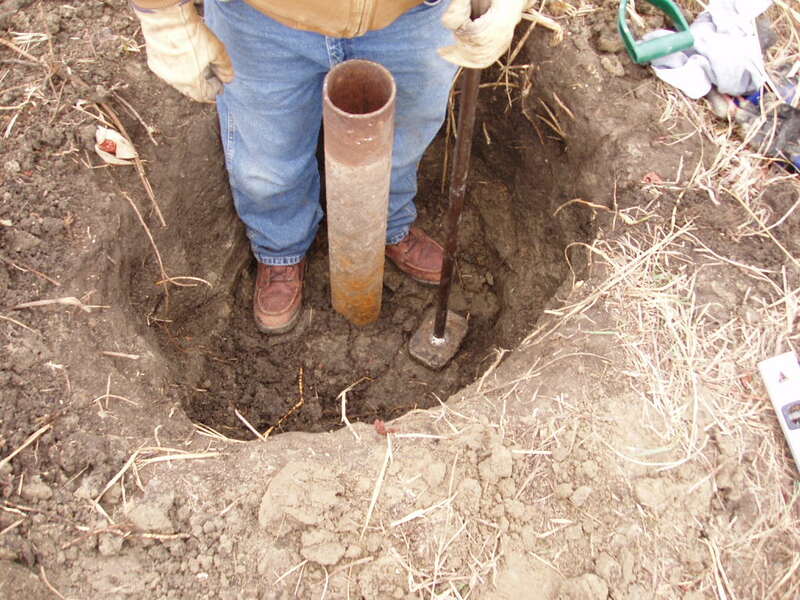 Approximately 12" of debris had lodged inside the bottom of the pipe which was cleaned out. 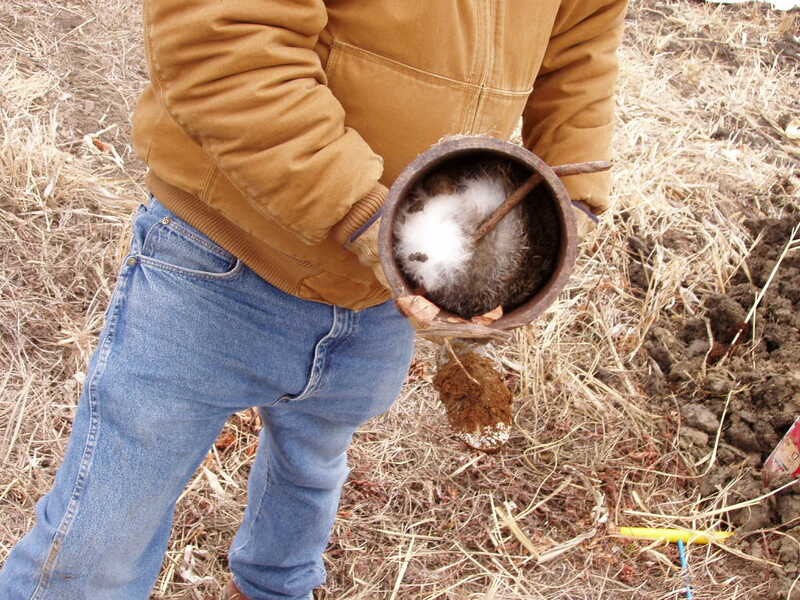 Another unexpected find was a cottontail rabbit that had crawled into the top of the pipe. 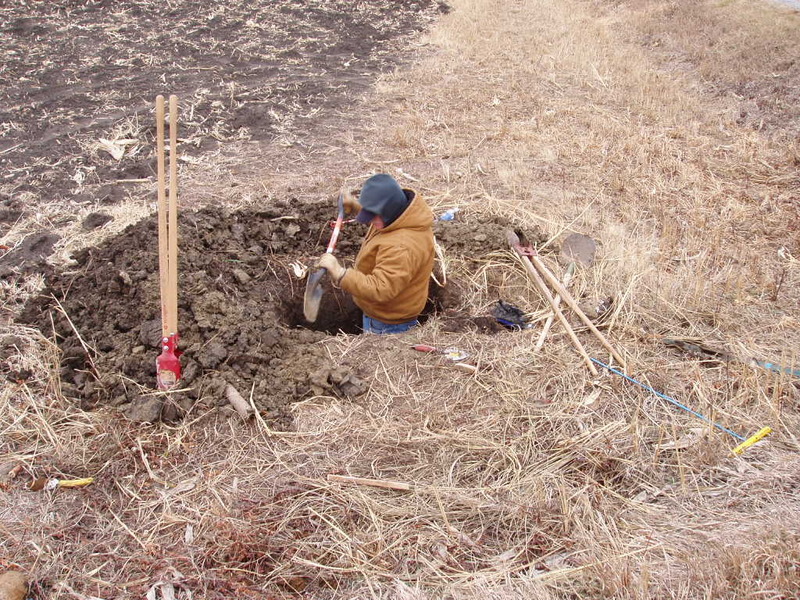 Gene taking his turn in the hole for further excavation. The lower stone bench mark that had not seen the light of day in 116 years! It measured 18"x18" and was 4" thick. It appeared to be cut and dressed limestone. The letters "U S B M" were intricately cut into the face in 2" high letters. Rust is visible where the bottom of the pipe had rested on the stone. A chaining pin gives a better perspective to the size of the stone. A view of the stone at the bottom of the hole as seen from above. A close-up view of the lower monument. The "bolt" turned out to actually be a small 3/16" diameter copper pin that was leaded into a 5/8" diameter drill hole in the center of the stone. A view of Jerry's feet showing the stone bench mark. Jerry with the 4' long pipe. Gene with the pipe and the new cap as we begin to refill the hole. 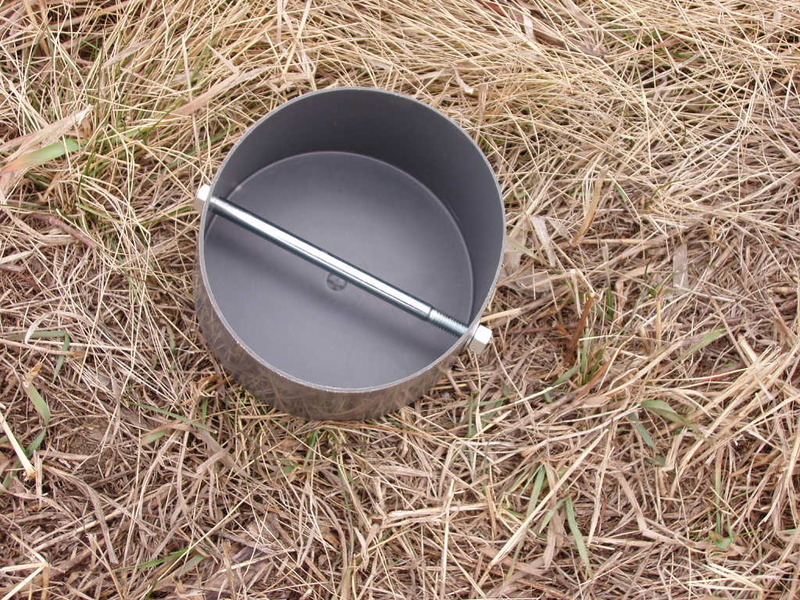 A close-up viw of the cap that was made for the pipe. The underside of the new cap. Packing the dirt around the pipe. Monument finished with protective signs added. A close-up view of the restored monument at the surface. 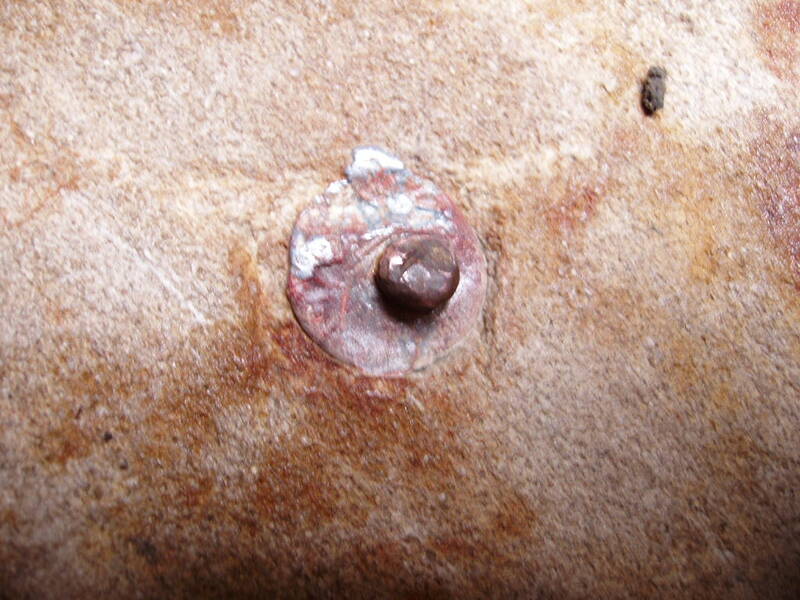 Access to the copper bolt in the stone will be made by removing this protective cap. This is a view of what a MORC bench mark should look like if the cap had not been taken. 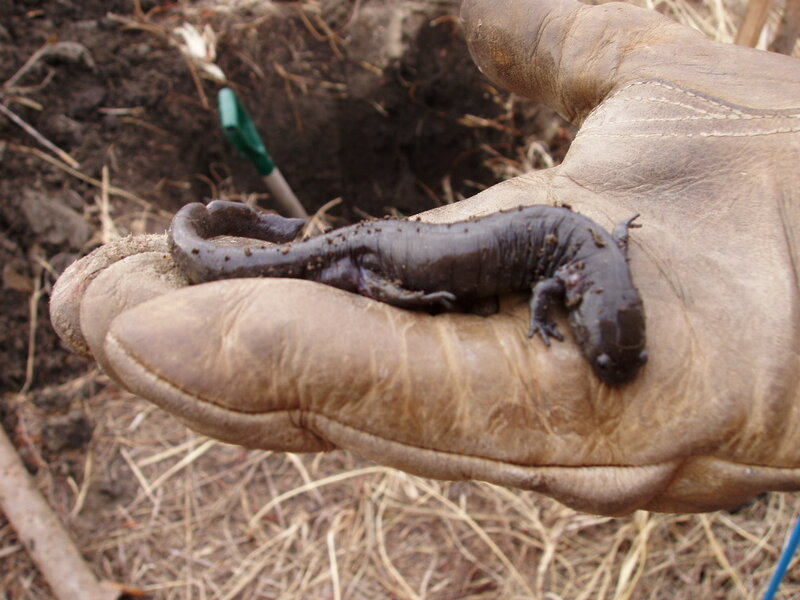 This one was found on a different date much further north in Iowa.